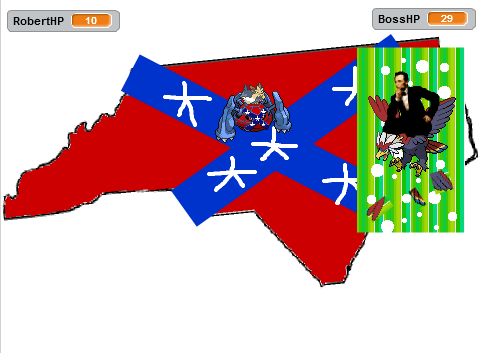 KoopaTV: Capture the Confederate Flag Strategy Guide Part 3: Boss Rush! A couple of important things to note: After any given move, Lincoln/Braviary briefly wait in place, and then they will shift their position a few pixels in a random direction for a brief period of time, and if invincibility frames are not already active, they will be vulnerable for a free hit. Also, for every state, Abraham Lincoln will have 30 HP. After Lincoln is defeated in a state, he will drop a Sitrus Berry in a predetermined area around the centre of the state. 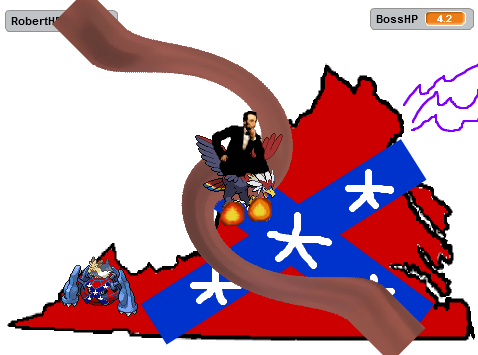 Robert E. Stoutland riding on Metagross begins the fight with 50 HP, and the only way to replenish that is via the Sitrus Berries. Fortunately, the Sitrus Berry allows Robert to have over 50 HP, which means that if you study this strategy guide and properly observe how to evade damage in the easier phases, you can accumulate a large reserve of hit points! Also, you cannot leave the state you are in until Lincoln is defeated in that state, and you cannot go to other states that are not the next state that Lincoln has fled to. This means you get a lot more breathing room (the whole screen) to fight, unlike the flag-collecting part of the game. Braviary is retreating after missing a Wing Attack. Base Effect: 2 damage upon contact. One hitbox. Description: Abraham Lincoln says, “Wing Attack”, changes his sprite colour slightly, and glides towards Robert's current position while spinning around for show. 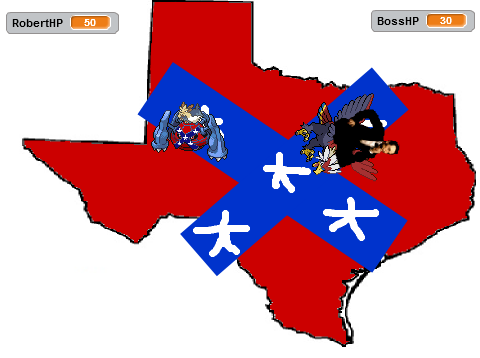 After reaching Robert's position (applying the hitbox), Braviary will fly back to Lincoln's original position when he first started the attack. When Lincoln says he'll use Wing Attack, simply move somewhere else on the screen. Lincoln has no invincibility frames, and it's easy to constantly be moving and sending out Rapidash to damage Lincoln from afar. Braviary is charging with a U-turn straight towards Robert! Base Effect: 1 damage upon contact. One hitbox. Description: Lincoln and Braviary turn into a big blue circle, say “U-Turn”, and then turn into the triangle-esque light blue arrow you see above, pointing towards whatever Robert's current position is. In a second's time, Braviary charges towards Robert's current position, applies the hitbox, turns around, and charges back to the original position, and then finally changes its sprite to Lincoln riding Braviary. Wing Attack: 33.33%, U-Turn: 66.66%. U-Turn is much faster than Wing Attack is, though it fortunately does much less damage. The challenge here is to avoid taking all of this fast chip-damage, while also trying to have Secret Power, in the form of a Crawdaunt's Aqua Jet, hit a constantly-moving Lincoln. Despite Aqua Jet's priority status in the Pokémon games, it takes a relatively substantial amount of time for its hitboxes to appear. The key to reliably get damage is to dodge whatever charging attack Lincoln does, and quickly set up the Aqua Jet for where Lincoln and Braviary will return after they charge. By the time they come back and shift their position relatively in-place (Aqua Jet's hitbox will be big enough to cover it), your attack will hit. Repeat several times and you can move on! Wait a minute, this is the same move Carbink used when Lillipup/Herdier were in Arkansas! Base Effect: 4 damage upon contact. One hitbox. Description: Just like the Rock Slide that Robert utilised back in the early days of venturing into Arkansas, this Rock Slide will summon three little rocks that turn into massive vertical spires, going downwards. Every part of each rock is all part of one hitbox. The Rock Slide happens when Abraham Lincoln says “Rock Slide”, and right when he finishes, the rocks slide down. They are summoned horizontally from Lincoln. Wing Attack 25%, U-Turn: 25%, Rock Slide: 50%. 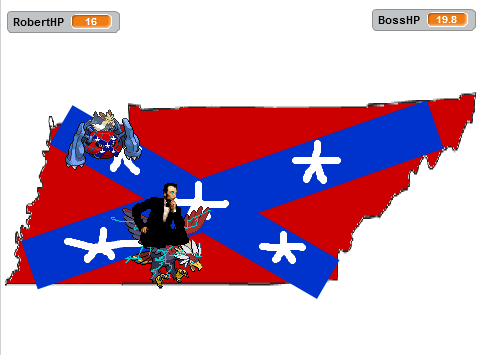 Dealing with Lincoln is Arkansas is very easy. You'll have access to Diancie's incredible Diamond Storm, with its massive hitboxes. There is no way for Rock Slide to hit you if you stay above Lincoln's sprite, so as long as you stay there, keep using Diamond Storm freely, and constantly strafe to avoid a Wing Attack or U-Turn, you shouldn't even take any damage. Braviary doesn't carry extra beaks around. Base Effect: One attack per hitbox contact; four hitboxes total. Description: Braviary will glide to Robert's position, turn around depending on where Robert is in relation to Lincoln, and let loose a series of four Fury Attacks, represented by a beak sprite right in front of Braviary. The beaks come out in this order: Straight, up, down, straight, and are in succession. Wing Attack: 14.3%,U-Turn: 14.3%, Rock Slide: 14.3%, Fury Attack: 57.1%. Now is probably a good time to mention that Robert has no invincibility frames, unlike his enemies. This is the first attack Robert will have to contend with that has more than one hitbox, after all. Fortunately, Robert is free to move while hit, for there isn't any hitstun. If Robert can get below or above Braviary while he's stuck Fury Attacking, and let loose a Magnolia, he can avoid damage while dealing it. Braviary and Lincoln suffering Brave Bird's recoil effect. Base Effect: 10 damage upon contact. One hitbox. If Brave Bird lands, Lincoln will suffer a 3 HP loss from recoil, unless Lincoln has 3 HP or below, then his HP will be at 1. Description: Lincoln will declare, “BRAVE BIRD!” He'll wait .4 seconds after he begins his declaration, and then Braviary will turn blue. Braviary and Abe will charge towards Robert and try to smash to his position. Regardless of whether or not they succeed, they will fly back to their original spot and wait a little bit. If they succeed, they will take recoil and their sprite will change accordingly. Wing Attack: 12.5%, U-Turn: 12.5%, Rock Slide: 12.5%, Fury Attack: 12.5%, Brave Bird: 50%. Unfortunately for Robert, the Music Notes Secret Power move lacks any kind of range and is quite weak, and he's up against an Abraham Lincoln that is addicted to using BRAVE BIRD! Brave Bird is also the first attack in Lincoln's arsenal that will do a substantial amount of damage if it hits, and it's faster than Wing Attack. 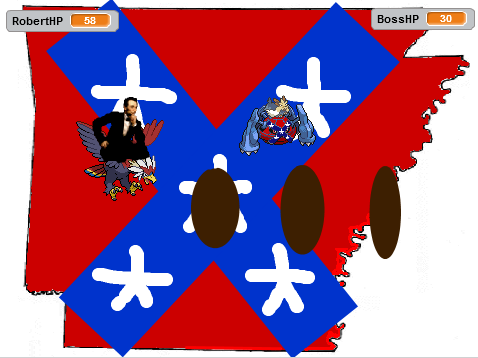 Robert must be patient for Tennessee, and use the lingering hitboxes of Music as a sort of trap. Bait Lincoln into approaching (which he'll do for everything besides Rock Slide) and leave the Music where he'll be. Constantly be moving and leaving behind the Music Notes. Eventually, Lincoln will fall, and you can move to the next state. You can also leave the Music where Lincoln will return to. It actually lasts long enough that if you hit him, you move away, he moves towards you, attacks, and then returns to his original spot, that the Music will hit him again once he returns. Looking rather buff there, aren't you, Abe? 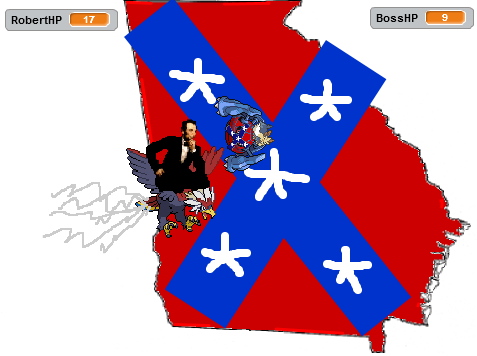 Base Effect: Increases damage and hitboxes of Abraham Lincoln's other moves and sprites. Description: Abraham Lincoln commands, “Work Up!” and increases his sprite by 20%. At this point, Lincoln's next move will do 5 more damage. So if it's a U-Turn, it'll be 6 damage. If it's Fury Attack, each beak will do 6 damage! Lincoln will lose 4% in size (120 to 116, 116 to 112, etc.) and 1 extra damage after every attack he does, until he's back to 100% and 0 extra damage... or he uses Work Up again and resets back to 120% and +5 extra damage. Wing Attack: 12.5%, U-Turn: 12.5%, Rock Slide: 12.5%, Fury Attack: 12.5%, Brave Bird: 12.5%, Work Up: 37.5%. While the might of a buffed Abraham Lincoln is terrifying, there is a disadvantage to having a larger sprite: Lincoln's hurtbox will be bigger, too. 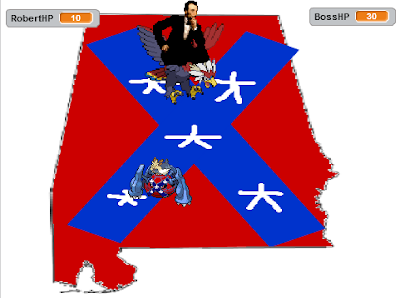 In Alabama, Robert will be guarded by the Cotton Guard-using Altaria. Unfortunately for Robert, unlike when dealing with Dylann Roof's bullets, the Cotton will not reduce or nullify any damage from his opponent. Fortunately, the attack comes out quickly, and can be spammed as Robert tries to avoid Lincoln's moves. Come in close in-between Lincoln's attacks and as he's using Work Up, and let him have it! Robert tries desperately to avoid Fly's target reticle! Base Effect: 6 damage upon contact. One hitbox. Description: Fly has an incredibly long start-up sequence. Lincoln will command a “Fly.” In the span of around a second, Braviary will go into a Fly sprite sequence, which involves turning into a light blue ball and disappearing upwards. Braviary then gets invincibility frames, and a robotic “tick-tick-tick-tick” sound occurs, as a targeting reticle materialises and follows Robert around. After ten ticks, Lincoln will descend in a grey ball downwards with a SWOOSH, and lose invincibility frames. Once the descent is complete, if Lincoln collides into Robert, Robert will be hit. Lincoln will remain where he landed. Wing Attack: 8.33%, U-Turn: 8.33%, Rock Slide: 8.33%, Fury Attack: 8.33%, Brave Bird: 8.33%, Work Up: 8.33%, Fly: 50%. As long as you're constantly moving and don't back yourself into an unnecessary corner, Fly is not a difficult move to avoid. You can shoot Oranges at Lincoln before he gets invincibility frames on Fly, and if you stay close enough to him when it's safe to do so, you can reduce his HP. The Oranges are yet another close-quarters move for Robert, but this time, there are ample opportunities to get hits. The challenge for Florida is to not be too intimidated by the sheer spectacle of the Fly move. Abraham Lincoln under the effects of Tailwind AND Work Up at the same time! Base Effect: Lincoln moves faster, and the start-up/ending lag for almost all of his moves is reduced. 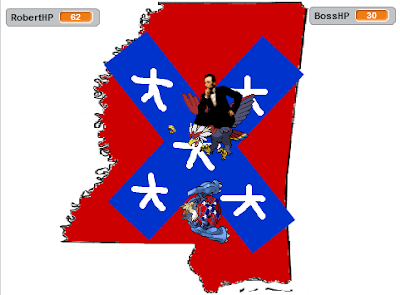 Description: Abraham Lincoln cries out, “Tailwind!”, and what appears to be some kind of wind (or gas) emits from Braviary's tail-feathers. Lincoln's next move will have all of its time cut in half (X / 2) for each stage of the move. The next attack Lincoln uses, the time will be divided by 1.8, then 1.6, then 1.4, then 1.2, until it's back at 1 and Tailwind wears off. Wing Attack: 9.1%, U-Turn: 9.1%, Rock Slide: 9.1%, Fury Attack: 9.1%, Brave Bird: 9.1%, Work Up: 9.1%, Fly: 9.1%, Tailwind: 36.4%. Tailwind might be the scariest move that Braviary knows, because with it, all sorts of terrifying things can happen. Many of these boss rush rounds have relied on taking advantage of the time that Lincoln takes between his attacks, or to hit him as he's using a slow attack. 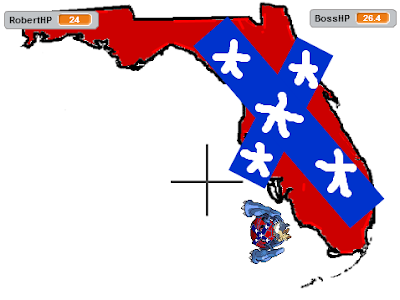 Tailwind can make him a serious threat at all times, and is something to look out for both in Georgia, and subsequent states. Fortunately, at least in Georgia, the Georgia Peach is both strong and has a large hitbox when Robert is using it atop of Metagross. That means Robert can stay a very safe distance and spam the Peach from afar. Robert barely dodging a Hyper Beam! If it hit, it would've been game over! Base Effect: 15 damage if hit by the main beam, 6 damage if hit by the very end of it after the main beam disappears. Those two hitboxes apply at different times. Description: Foreshadowed in the cutscene before the boss fight, it's Braviary's strongest move: Hyper Beam! Abraham Lincoln will announce, “USE YOUR HYPER BEAM!” Then he'll fly to one of the sides of the screen (whichever he's closest to) and at whatever y-axis position Robert is at, and launch a HYPER BEAM! 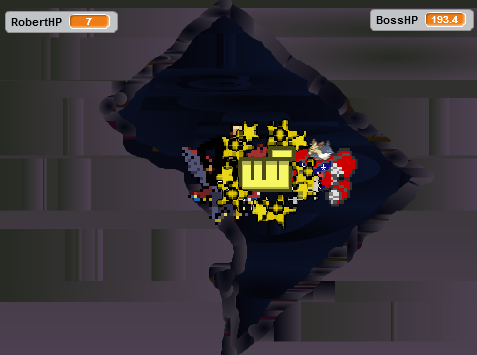 The Hyper Beam goes across the whole screen, and the first 15 damage hitbox applies if any of it touches Robert. Then, the main beam part disappears, leaving just the explosion at the end of it, which moves a little bit. If Robert is in the path of that, then the second hitbox applies. After the Hyper Beam completely dissipates, Braviary and Lincoln will glide back to their original position and Abe will breathe heavily. (Even though Braviary did all the work.) Be warned that if you defeat Lincoln while he's summoning Hyper Beam, it'll...still come out, even if he's not around. Wing Attack: 7.1%, U-Turn: 7.1%, Rock Slide: 7.1%, Fury Attack: 7.1%, Brave Bird: 7.1%, Work Up: 7.1%, Fly: 7.1%, Tailwind: 7.1%, Hyper Beam: 42.9%. Hyper Beam can be terrifying, especially if Lincoln has buffed himself with a Work Up. Tailwind doesn't make the actual beam go any faster, fortunately. However, Robert is also equipped with HIS strongest Secret Power move, the Palmetto Tree. This will always defeat Lincoln in two hits. Sure, it takes a long time to set up and land, but you can set up the tree at Lincoln's position pre-Hyper Beam. 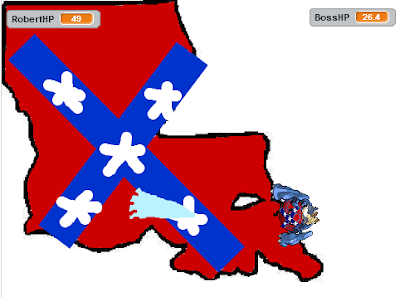 He'll fly off, Hyper Beam, and fly back right to the Palmetto Tree... and you can have it crash down on him. Remember: The Palmetto Tree is basically a remote-controlled bomb. You can activate it while being nowhere near it. Braviary takes a brief respite to heal himself. Base Effect: Abraham Lincoln's HP is restored after every move he makes, and he can surpass his HP cap this way. Description: Abraham Lincoln declares, “Roost up!” Him and Braviary are surrounded by a green healing aura (and Braviary drops some feathers), and his HP will go up by 6. After his next move, it'll go up by 5, then 4, etcetera, until 0 or Lincoln uses another Roost. If healing is applied, Lincoln's sprite will briefly have green healing sparkles. Wing Attack: 7.1%, U-Turn: 7.1%, Rock Slide: 7.1%, Fury Attack: 7.1%, Brave Bird: 7.1%, Work Up: 7.1%, Fly: 7.1%, Tailwind: 7.1%, Hyper Beam: 7.1%, Roost: 35.7%. If Lincoln goes ahead and activates Roost, he could possibly be in a situation where he can heal your damage faster than you can do it. Fortunately, if he just keeps using Roost the whole time, at least he won't hurt you. You'll want to constantly be using Tar Heel. You'll always be strafing and moving around anyway, and Tar Heel just makes it so your movement does lingering damage if Braviary flies over it. If you're constantly applying a fresh set of footprints, then you just need to focus on avoiding being hit and the damage will take care of itself. This Heat Wave is blocking Robert's HP count! Base Effect: 3 damage on initial hitbox, and 1 damage afterwards for 12 hitboxes. Description: “Heat Wave!” As Lincoln demands it, Braviary's talons have fireballs on them! An initial horizontal bar comes out from Braviary as it flies right to the centre of the stage, and the bar waves around clockwise 12 times. In the lower-fidelity version of the game, the shape of the Heat Wave at each rotation is static, but in the higher-fidelity one it's random. Each rotation has a hitbox. Wing Attack: 5%, U-Turn: 5%, Rock Slide: 5%, Fury Attack: 5%, Brave Bird: 5%, Work Up: 5%, Fly: 5%, Tailwind: 5%, Hyper Beam: 5% Roost: 5%, Heat Wave: 50%. The Virginia Royalty crowns are hard to hit for a mobile target, but Lincoln is stationary and vulnerable for the entire duration of a Heat Wave. This can make it possible to get the double hit for the Royalty attack, and deplete his hit-points. If Lincoln is not using Heat Wave, then hitting him might be a bit tougher, but there are plenty of opportunities where he'll be stationary for long enough. To avoid Heat Wave, simply move ahead of it. You'll want to make the most of the opportunities you will be below Lincoln. After a very long fight with Abraham Lincoln and Braviary, it appears he is finally defeated for the last time. Unfortunately, Lincoln denies defeat, and has Braviary use one final move: Whirlwind! This Whirlwind takes in Robert E. Stoutland and Metagross to a mysterious, dark place, known simply in the coding as Hell. This is THE final boss fight. 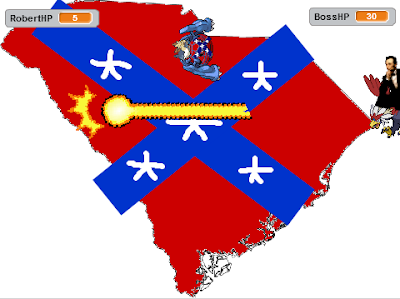 The one with the Ominous Latin Chanting I promised and published in the Capture the Confederate Flag voice-acting video article. Abraham Lincoln will increase his HP to a whopping 200. And Robert's? Well, that depends on your path through the flag-collecting part of the game. The HP you get is a function of your current HP after defeating Lincoln in Virginia, and plus 20 HP if you rescued Lilligant in Arkansas, and plus 10 HP for each Petilil you rescued in the other states. That can leave you with a maximum of an added 120 HP... or a minimum of 0, if you went for the most difficult ending where you didn't defeat a single Dylann Roof or Bill Clinton in the flag-collecting game. Regardless, Metagross will Mega-Evolve into Mega Metagross! (How that happens depends on your ending.) Mega Metagross doesn't use Robert's Secret Power, but instead has a context-sensitive attack with your Spacebar. Which move is used depends on Robert's proximity with Lincoln. Flash Cannon does a base 5 damage, and Meteor Mash does a base 13 damage. Flash Cannon homes in on Lincoln from wherever you are, so it's incredibly safe to spam it. Meteor Mash, is, of course, faster, and has a really satisfying sound effect on landing. Abraham Lincoln has two different attack patterns. If he is above 50 HP, he will use one of Work Up, Tailwind, or Roost (at equal chances for each — 33.33%), and then one of Wing Attack, U-Turn, Rock Slide, Fury Attack, Brave Bird, Fly, or Hyper Beam (at equal chances of each — 12.5%). If he gets below 50%, he will panic. He'll use Work Up, then Tailwind, then Roost, all in succession, and without any of those buffs having their effects worn off because he used another move. Lincoln will then command 5 attacks in a row, with these %s for each individual attack being called (these are independent of one another): Wing Attack: 7.1%, Fury Attack: 7.1%, Rock Slide: 7.1%, U-Turn: 7.1%, Brave Bird: 28.6%, Fly: 7.1%, Hyper Beam: 14.3%, Heat Wave: 21.4%. After each of those attacks, the buffs will get weaker. After the five attacks are done, he'll repeat the three buff moves and then five more attacks, until you put him out of his misery. ...And when you do, you're greeted with your last “challenge”: A quicktime event! ...Just press the spacebar, and do it before you get a non-standard game over. And you get a long time to do it. Nice parody on my part, right? After that, watch the ending cutscene and read the credits. You'll be done! You can go and play the game again for the other endings at that point, or spoil yourself and know what the scripts are by watching the voice-acting video. ...Do whatever is more fun for you. Either way, I hope you enjoyed everything Capture the Confederate Flag has to offer! Ludwig also hopes you enjoyed this series of strategy guides. It was a lot of work putting this one together in particular, but it was even more work programming the whole game by himself! Ludwig also did all of the research by himself, which makes you wonder what the other staffers even do around here.